Research summary: The advantages of working with a team to develop an idea are well established, but surprisingly, little is known about why some idea generators ignore these advantages by developing their ideas alone. To answer this question, we study two important trade-offs. First, working with a team provides access to additional resources but also leads to increased coordination costs. Second, sharing the risks and costs of developing an idea necessitates sharing the potential rewards of a successful idea. We use unique data on idea generators and their submission of ideas to an innovation program in a large European company between 1996 and 2008 to show how the two different trade-offs affect the decision of idea generators to collaborate with a team. Managerial summary: Organizations usually form teams to develop and execute innovative ideas. When people have the choice, however, will they also form a team or will they develop ideas alone? By studying idea generators and their voluntary submissions of breakthrough ideas to an innovation program, we find that the success rate is much higher for team ideas. 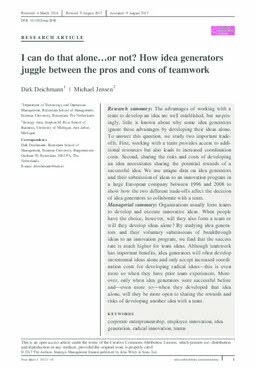 Although teamwork has important benefits, idea generators will often develop incremental ideas alone and only accept increased coordination costs for developing radical ideas-this is even more so when they have prior team experiences. Moreover, only when idea generators were successful before and-even more so-when they developed that idea alone, will they be more open to sharing the rewards and risks of developing another idea with a team.